In this series of letters below, mainly correspondence from Stevenson to Capt. Taylor, it is hoped to illustrate more fully the relationship between employer and employee. In fact, Capt. Taylor was four years older than Stevenson! Towards the end of his "Account" of 1824 Stevenson gives the distinct impression of being almost avuncular in his attitude towards his men (no doubt in no small way due to their successes at the Bell Rock). These letters, however, give a better insight into Stevenson, the man in charge. Whatever else, they show clearly his meticulous attention to detail as well as his organising abilities and business acumen. His instructions to Capt.Taylor over the years give an interesting insight of that of a strict employer when required, and a caring one when the occasion warranted. Capt Taylor was Stevenson's eyes and ears in Arbroath as the facsimile shows! He was also the most important man in the Arbroath establishment at the Signal Tower, and as Master of the Bell Rock of the Tender his responsibility to the lightkeepers out at the Rock was second to none. That, however, did not stop him from attending to other lighthouse duties in and around the Scottish coast. The facsimilie below shows Capt. Taylor responding to Stevenson's instructions. Note that the entry date to the Signal Tower was 1812, NOT 1813 as the history books will tell you! "I wish the Lieutenant had been shivering some of the French or American timbers and I am sure this is his own sentiment." "It was amongst the last words I said to you to keep a small book and mention all the men's time and materials got for the vessel and to see the materials properly applied as if the vessel were your own - let me hear from you how things come on and say when you entered the service. I will thank you to send on shore any empty Harness tubs, Butter kits, Bread bags or Meal sacks you can spare, making mention at the same time if there is anything in particular that you stand in need of. "I wish you would send on shore all the empty bread bags, butter kitts and meal barrels you have. Turn the butter out of the last 82lb Kitt that was sent to the Float; weigh the Kitt and send me a note of the weight of it. This will give you the Net Weight of the Butter. There is a remainder of oat meal sent you which makes up one Load with the Barrel that was sent from East Haven. I hope you have taken an Inventory of your Stock of Provisions on hand 1st Feb. being Quarter day - I beg you will attend to my letter of the 2nd inst." "Enclosed you have the seamen's times with a statement of their wages and balance due them 1st Feb. which I will you to bring on shore with if they want the balance to send to their families. Mr Calder goes off to relieve you and William Reid to relieve John Reid. "It is really distressing to think that you did not get the Stores put on board the Floating Light the morning you left this - particularly as you have a cargo supply of oil for that Vessel and you must know that her stock of oil is but short and that she will soon be in absolute want. I therefore hope you will bear in mind the importance of getting to that vessel and that you will not lose a moment as soon as the weather will in the smallest degree permit and see to put a few anchors of oil on board of her before you come in here although you should not be able to give her the rest of the stores.
" I have sent the Courses of the Sir Joseph to the Sail Makers to get middle stitched - I have seen your letter to Mrs Taylor and hope you are getting better." The Beef could not be got ready tonight but I fancy you are pretty well supplied you will receive two Casks packed up with bottled porter and spirit.
" . . . There is a monthly provision returned wanted which I would wish to have immediately for Aug. When you go off to the Rock you will remove a cask of Powder which is now lying in the Beacon and put it into the Cannisters you have for holding Powder on board of the Sir J. Banks. If they will not hold it all, let the remainder be consigned to the bottom of the sea if no place of safety can be got for it - let this be done before a fire is lighted upon the Beacon. "In the event of everything being found in good order you will proceed to Leith with the Schooner after landing the Artificers at Arbroath. "If the Weather and other circumstances permit you will examine the Buoy at the Carr Rock. On Thursday the 8th inst. 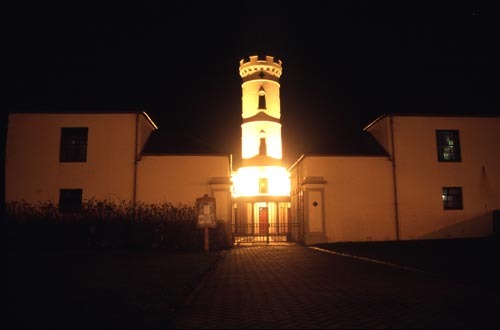 and every night following until your arrival in the Roads there will be coloured lights shown from Inchkeith Lighthouse to which you are required to give the most diligent and to enter the Appearance immediately into the Logbook. ½ past 10 the shades will be removed for the night. "These Lights must be watched at the above periods between the Isle of May and Ellyness. The weather permitting a boat must call at the Inch for Mr Forrest who is to exhibit these Lights. "PS - Mr Taylor not withstanding the arrangement stated on the other side will act according to the weather and other circumstances agreeably to the best of his judgement and for the good of the Service. "I am happy to find that you are in the way of recovery from your illness; that you have made another successful trip to the rock and that you found all well there. "It will be necessary to pay the people for the last trip and the same as if they had made a landing, as the returns of the vessel without the landing was by your directions and it is always expected in every case of this kind that you will cut for the best. "If there be a full stock of everything at the rock, you will have the less to land; you will however miss no opportunity of going at the streams when the weather permits unless the business of the Lighthouse requires your being employed otherwise - and then in your absence from the station you must engage a boat to attend the signals at a call and go off and shift the lightkeepers. You will need to keep this arrangement in view soon as you will in all probability be sent off the station on a short trip. "The letter you have sent may stand for your weekly letter but you have said nothing about the foundations of the bulwark. "I have been duly looking for an Inventory of the articles intended for Arbroath in order to write you upon this intended trip to Fifeness and Leith - after calling at the rock and doing what is necessary there. "Mr Soutar's absence has however prevented him from writing to Mr Slight and furnishing him with the Inventory - but it is perhaps of less consequence as you have a general knowledge of what is wanted and the purpose or service the articles are to be applied and can enter them into your books accordingly. "As it will not answer at this season to take out the Smeaton's Ballard you must only load her with the legs - but I can hardly think there will be more than she can conveniently or safely carry - of this however you will judge and if you cannot take the whole at this trip another must be made. "When you go off to the Lighthouse and supply it fully you will proceed to Fifeness and in the event of the weather not favouring a landing at Fife it will be advisable to proceed to Leith with the Yacht's people and do the business of the Carr in going down the Frith. I and no doubt you would wish to get the cranes, crabs and other unwieldly and weighty articles out of the ship while the yacht's people are on board but the weather and other circumstances must direct you in this matter. "When you are out if the weather does not admit of a landing at the Bell Rock it may even be advisable to come up the Frith before landing at the Lighthouse - but the state and supply of things for the use of the Lighthouse must regulate this always keeping in mind that no service is of higher importance to the Smeaton than attending the Bell Rock Lighthouse. "You will have much to do at the Carr this season; as soon possible you are to make a trip to Aberdeen for paving stones; thereafter you go to Kingoodie for the remaining cargo and you have two trips to make to Newcastle. "I am very sorry to learn that you are again laid down with your old complaint and it must be vexing indeed to one accustomed to go aloft to be creeping along with complaints that are generally the companions of the soft and luxurious - but in whatever shape the hand of providence is pleased to afflict us we must submit - and it is so far happy for you that you have the consolation to think it is not a distress of your own in bringing. "I should be sorry if you were not able to go with the ship at this time; however as I have said before you must have patience and do not use freedoms with yourself while in trouble that may be hurtful to a speedy recovery. "It is vexing to think that the valuable glass in the signal room should have been liable to an accident of the kind you mention. I wish the Lieutenant had been shivering some of the French or American timbers and I am sure this is his own sentiment. I will enquire into this circumstance when I get to Arbroath. "I write to Mr Drummond of Perth by this post offering him Fifty Pounds for the Hedderwick complete. "You may draw on Mr Cunningham the secretary for Twenty-five Pounds and give me advice in the same manner as is done by John Peter on the like occasions. "I am duly favoured with your letter of the 31st of last month from which I see you have had rather a perplexing and hard beginning with the Carr. "Owing to the state of the weather I am at a loss how to address for you at Fifeness. When you have finished there, and Mr Slight (under whose orders it will be your lot for a time to sail a great deal) thinks he can spare you to come up to Leith for the long crane you can take the first fair wind up the Frith - I cannot promise that you will get the balance crane but the screws are ready, and it is in great forwardness. Mr Slight had better consider well what he may require from Leith as the probability is that you will not soon return this way if it be possible to get the two cranes down with you, the one into the hold, and the other upon deck. "I have letters from Aberdeen wanting to get the pavement shipped and when you return to the Rock again after being at Leith you will proceed for Aberdeen and load the paving stones agreeably to directions from Mr Gildowie. "When you come here you will get the person along with you who is to out for Mr Wishart at the Lighthouse. He left this some days since for Glasgow. Expecting to see you soon at Leith. "I have received your letter of the 23rd of this month acquainting me that you have drawn Fifty Pounds upon the Cashier to Account of the transaction for the Current Quarter - and also that you are about to sail from Arbroath for the Bell and Carr Rocks. "I propose to leave this on Saturday for the works of the Carr but least this should find you at that place and in readiness to sail for the southward - you need not wait my arrival but proceed with the first favourable opportunity for Newcastle and then load a full Cargo of the best coal which can be procured and with these return to Arbroath where you will receive further instructions regarding the distribution of the coals. 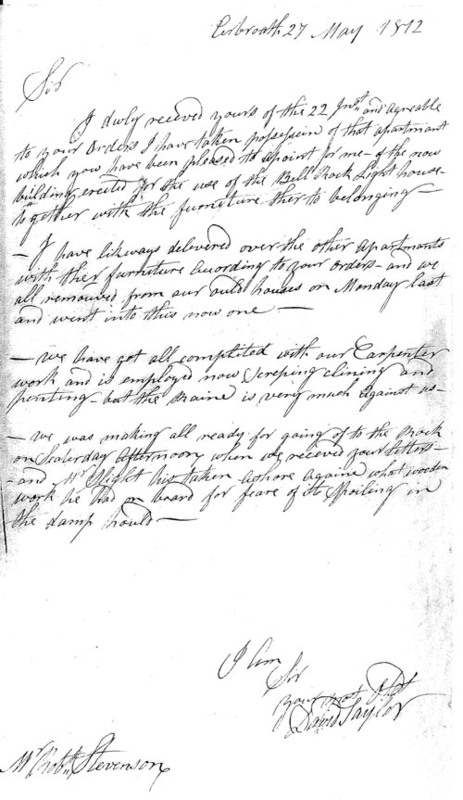 "I presume your late draught of money will enable you to pay this cargo but if not so provided when you sailed it may be necessary to draw again - in clearing out the coals it will be necessary to do so for the Northern Lighthouses as the cargo may come to be landed within the jurisdiction or collection of two other different custom houses. "That you may be enabled to measure out the coals with accuracy it will be proper for you to provide a measure that will give out the Cargo in Tons. "Get this measure at Newcastle and be able to state from your own observations how many fills go to make the ton. Upon your arrival at Newcastle write to me and be sure that you call at the Post Office for letters. Wishing you a speedy trip." "When you left this yesterday it escaped me to desire that you should see if the two men belonging to the Yacht be relieved before you sail and if so you could bring them to the Smeaton to Arbroath. By applying to Mr Gibb the Engineer you will get notice of the reply from the Admiralty as it was requested to be addressed to Provost Young who is one of the Lighthouse Commissioners. "A most unpleasant report has reached me that nobody can be admitted to the Lighthouse or Signal Room without an order - and a Gentleman of Perth writes his friend in Edinburgh to obtain this from the Commissioners - I have often regretted your short and uncivil manner - and I fear this is not confined to yourself - to such unobliging and unaccommodating behaviour every civility becomes a task and a burden - which in other circumstances and to persons of different habits would be a real source of pleasure. I must look to you for an explanation of such conduct and charge you while in your present situation to be more accommodating to persons coming to visit the premises belonging to the Lighthouse. "Upon receipt of this letter or as soon thereafter as possible you will be so good as to favour me with all your remarks regarding to or interesting about the Bell Rock Lighthouse after so long a stay upon it in the depth of winter - I mean that your remarks should be extended at some length and that they should embrace whatever may have appeared to you as interesting to a stranger either regarding the effects of the sea upon the rock or lighthouse. Likewise that you take notice of the chief conveniences or disadvantages connected with the building or condition of the Lighthouse. "I duly received your letters giving me a very interesting account of your stay at the Bell Rock which I have read oftener than once with great pleasure. "I reply to your enquiry regarding the relieving of the Lightkeepers at this term. You will carry off Mr Peters the steward who will in all probability be relieved by Mr Wishart as Mr Adamson will reach the South Rock about Friday. "In going over the shipping accompts. for the year ending at last Quarter day I find that the Smeaton's crew are not victualled so cheap as the Yacht's by per day. Now as things are fully cheaper in Arbroath than at Leith it will be necessary that you have some conversation with the steward and afterwards write to me upon the subject. In the meantime you may lay your account with a considerable deduction taking place upon the allowance for the future. You will write to me especially regarding this difference in the victualling bills and take such steps with the concurrence of the steward who is in future to arrange these victualling bills as will render it easy to make them up with accuracy. Speak also to Mr Kennedy upon the subject; you will continue your letters of advice as formerly. 1.The crew of the Bell Rock tender shall consist of yourself as Master at Seventy-two pounds per annum; a Mate at Forty-eight guineas per annum; and 2 Able Seamen at Thirty pounds per annum. 2.The Master and Mate to be constantly employed in the Lighthouse service at sea and on shore. The seamen to be at all times at the call of the Master and Mate. During the whole period that the ship lies in Arbroath all hands will victual themselves without any allowance of board wages. 4.In future the Steward of the Lighthouse Service will make all contracts and bargains for the provisions of the Tender and of the Lighthouse to whom the provision returns will in future be made through the hands of Mr Lachlan Kennedy who will also countersign the Pay and Disbursement Bills with his initials. 5.It is entrusted to Mr Kennedy to make such necessary arrangements in the accompts. and Books of this department as he may see to be necessary for enabling the Steward of the Lighthouse service to make up in one bill quarterly or annually a complete bill exhibiting the entire charges of the Tender of the Lighthouse or Bell Rock department." "I hope you find things in your new Ship pretty much to your mind - I am sorry to observe from the state of the weather that you are likely to have somewhat rough weather but it will put you in mind of the Days of Youre - and at the same time make you enjoy the delightful repose of a smooth water Frith when it comes again in your way. "Capt. Wilson arrived here on Sunday the 29th and on Tuesday he went to the Carr Rock and got on board of the Smeaton; the man you put on board from the yacht was paid off yesterday, and things are once more arranged in a certain way. "I understand you have got Capt. Pool on board of the yacht - regarding whom I must observe that he had not my authority for this in any other day - if he could make himself agreeable to you and to Mr Wilson - it would give me that pleasure which I hope always to feel in seeing the Bell Rock Hands made right - especially such of them as have acted in an official capacity - but that I would not consent to disturb the peace of a ship with any person whatsoever and of course in the event of returning to the Service he must consider himself as wholly amenable to the Master of the Vessel on which he was on board, as I am sorry to say that he does not answer well with having a charge. "I trust that in your hands the Yacht will be most secure by your attention, and keeping a special outlook amongst the rapid tides and rocks of Orkney and the Highlands; that the Ship will lose nothing in point of cleanliness and good order both in hull and rigging and if a favourable opportunity occurs you will see to return her to port with the waste boards and her sides new painted. "It will be proper that you call at Carron in coming down the Canal in case of its answering to bring the castings to Leith connected with the new Lightroom intended for the May. The Buoy at Carr drifted in the late gales, but Mr Soutar got another laid down on the 30th of last month. "If the season if favourable it will I hope be the last job of this kind. "Wishing you a prosperous voyage. "I have received your letter of the 2nd of this month and I am happy to find that you have at length succeeded in getting to the Rock and that you there found everything in good order. "It surprises me much to learn that you have yet to be told that instead of requiring two days to fit out a Buoy and Moorings for the Carr you should have it always ready at least in one tide's notice. "You are now employed and you expect to have all on board tomorrow night." "Pray what have you been doing for the last six weeks. "I am exceedingly happy to find that the Smeaton and Praam and their respective crews have got into safe harbours as we had an exceeding hard gale all last night and this morning. "The Smeaton is much wanted here to get down a pair of Horses that must be purchased for the works at the Island of May. But she is still more pressingly wanted to bring Coals from the Wemyss for the Light to which you will attend as soon as the weather and the affairs of the Bell Rock Lighthouse will permit. You will require to load three or four Cargoes there doing at the same time what is pressingly wanted otherwise. "Mr Peters will be at Arbroath to go off for the Rock to take charge for Mr Kennedy - at least for a time as he accompanies Mr Forrest to Galloway upon the business of the new Lighthouse to be erected at the Point of Corsil. "You will load Coals at the Wemyss Coalworks for the use of the Light of May - sufficient to supply the Light till the month of January and upon producing this letter general Wemyss manager will give the necessary directions for the Coals being furnished. "These Coals are to be charged to the Commissioners of the Northern Lighthouses and the Accompt must reach me early July. "In case this should overtake you at Arbroath, it brings your ship's protection, but I am particularly anxious to acquaint you that the Island of May is almost short of Fuel and that your attendance for a supply is wanted as soon as possible. Mr Soutar is to sail tomorrow morning with the Carr Rock and does not leave that station with the Yacht till you reach the Frith. I hope it will be in your power to get the business of the Bell Rock done as you pass. "You will lose no time in coming up the Frith for the supply of the May with Fuel as the late gales here have lately reduced the stock. If there is a Cargo or even part of a Cargo to be got with propriety in Arbroath take them on board for the May so as to save time. "The Yacht sails tomorrow morning with the Carr Rock but the one vessel is too large and the other is too small for this service. The Yacht remains on the May station till the Smeaton gets up. "I hope you will be able to do the duty of the Rock in passing. Tell Mr Kennedy to come here through Fife on Monday afternoon. "The cast metal Crane belonging to the Lighthouse Service being now disposed of to Lord Elgin with this provision that it is to be put free on board - you will with as little delay as possible procure the assistance of James Glen and any other persons or workmen you may require to take down the Crane and have it ready to ship. You will deliver the whole apparatus belonging to the Crane as well what is now attached to it as what may be in store belonging to it. To prevent all mistake you will deliver the Crane for inventory a duplicate of which signed by the person you deliver it to will form your receipt in your Books. Write me when the Crane is ready to ship as I expect the Yacht to be clear of the May in the course of this week you will acquaint me as nearly as possible when the Smeaton will be out of the Carpenters hands particular with the repairs connected with her stern post. "I shall by and by send you a specification of the vessel for the Bell Rock tender to learn the terms at Arbroath, but I am not however certain as to the immediate building of the Vessel. "I have seen your letter to Mr Stevenson of the 22 inst. in reply to which I beg leave to inform you that the Yacht is down the Frith but she is expected up in a day or two and you may expect to hear soon whether or not she can attend to the duty of the rock at the ensuing streams. "As the year is now drawing to a close we shall want in all the accounts that are running on at Arbroath sent. You will get them collected and sent up here by Saturday, 30th inst. "It is uncertain when the Crane may be sent for, you will therefore take all its parts ot the Storehouse and have it in such a way that Mrs Taylor can deliver it if you should happen to be from home when the vessel goes for it. "In your letter of 3rd inst you mention your having been at the Rock and changed the Keepers and that you found things at the Lighthouse in pretty good order. Now I wish to know by return of post if things are in their usual good order as I am rather at a loss to know what may be your meaning in the doubtful expression of pretty good. I always understand things to be in the best possible order unless otherwised expressed. "You are hereby instructed and directed to bring Mr Dawson ashore with you as soon as you can get off to the Bell Rock; intimate to his family that he is to go to Corswall Lighthouse that his Articles may be in readiness by the time he comes ashore. "Intimate also to Mr Dawson that he is to proceed for Edinburgh and Corswall after being one day at Arbroath as he may not be required to return to the Bell Rock Lighthouse it will be proper for him to bring his working clothes etc with him and a proper stock of everything to serve him till you get at Corswall with the Pharos. "You are hereby directed and instructed to give me a written statement of the circumstances of the last landing at the Bell Rock on the 7th inst. of this month, stating the appearance of the weather and the condition of the sea as nearly as possible. You will describe the conduct of and behaviour of the Lightkeepers when the boat approached the Rock and especially allude to the circumstances of the Boat touching the Rock and what means were used and exertions made by and your assistants after she struck or grounded upon the Rock. "Although Capt. Taylor by no means says anything of inattention yet there is nothing said of the exertions of the Lightkeepers. "Now it appears to me that if one of the Lightkeepers had been upon the outer point of the Rock next to Reid's Ledge with a coil of rope in his hand agreeably to instructions, upon the approach of the Boat such assistance would have been of great service and might in part have averted the danger. "Your answer is expected by the return of the Pharos if the weather will permit. "I am sorry to see you so vexed and troubled about the proposed change. People often drive at their views of things against any consideration or circumstance and after all we see that what is intended happens best. A man is in a very unfortunate state when his family is divided in their opinions and sentiments. "There is at present no opening at the Bell Rock. When there is one the arrangements will again come under consideration at present for a time. While the Pharos is moving about so much I do not wish the Rock to be without a special lookout. "You are hereby directed and instructed to take charge of the Stores and Implements belonging to the Lighthouse Service as Storekeeper at Leith and you will accordingly be put in possession by Mr Kennedy. "You are hereby directed and instructed to take of Inchkeith Lighthouse as principal Lightkeeper till further order." "As Ships Husband for the Lighthouse Yacht you are hereby directed and instructed to take such charge of her Stores and Materials as usually devolve upon persons acting in that capacity. "You will therefore accompany Capt. Soutar in making a complete Inventory and overhaul of the Ship that she may be put in complete sailing order by the latter end of this month. "Inclosed I have the honour of sending your Lordship a copy of my memorandum to McUrich. He is a very plain passive sort of person but fully the best smack sailor we have in the Lighthouse Service. He is very trusty in bad weather and is accustomed only to a single glass of grog. "Mr Taylor who accompanies the Antelope to the Bell Rock is also an excellent Pilot on the East coast. He was long master of the Bell Rock Tender. But is now Storekeeper at Leith for the Lighthouse Service. He will land the party with great safety at the Isle of May and the Bell Rock Lighthouse. He is also a good pilot into the Frith and River of Tay . . .
"Mr Stevenson begs to notice to Capt. Taylor that he is much at a loss to account for his very irregular attendance at the Office. office in 1841. He was to die in a drowning accident in Arbroath harbour two years later.